“If you want something done, ask a busy person.” Do you ever revert to this time-tested pearl of wisdom in your dental practice? Are those busy people the same ones who have taken the time to fully understand the ins and outs and full potential of your practice management software? The ones who know exactly where to find the information you need on the spot? I’ll bet they are. The more I speak to Dentists and Managers about office productivity and workflow efficiency, the more I feel the need to champion the critical impact of knowledge on practice performance and growth. Mastery of your software builds confidence, and proficiency with organizational aids like ABELDent’s Patient Manager and Treatment Manager can make the difference between an average and a superior employee. We all have the same 24 hours in a day. So what’s the differentiator between “can do”and “no way”? Top performers don’t necessarily work harder – they work smarter. Employees rated by their managers as 9s and 10s on a 10-point performance scale are not only three times more valuable than the average employee, they are responsible for 61% of the total work done in their departments. 83% of managers and 77% of peers say these top performers are less stressed than their coworkers. So how can you make all your workers your best workers? 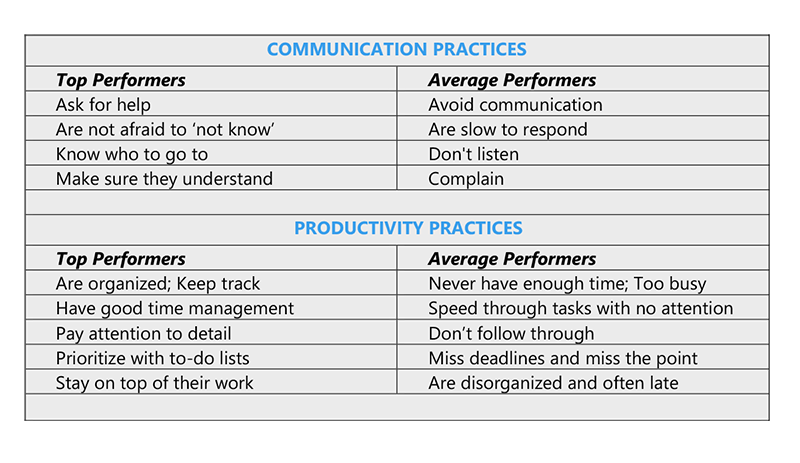 Help them embrace a few productivity practices.